Joy Creek Photo Archive (c) all rights reserved (Daphne collina x D. arbuscula) Daphne susannae (x) 'Lawrence Crocker' was found by its namesake at his nursery Siskiyou Rare Plant Nursery and originally released through that nursery. 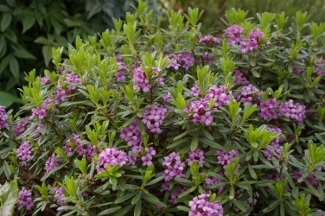 This spontaneous hybrid has proven to be an easy-to-grow evergreen shrub that continues to bloom on new growth throughout the summer. Summer. 3 ft. x 6-8 ft.